You know when it’s a nice summer day and your sitting at the beach, on the deck or by the pool and you’re looking for a fun, light summer read? That’s exactly what Boys, Bears and a Serious Pair of Hiking Boots is. Yes, the title is a bit of a mouth full, but that’s the only super heavy thing about this book. Jenna was a likable character, even if she did sprout off a bit too much about all things environment, at least in the beginning. As the book went on, she mellowed out and learned the very valuable life lesson that there is two sides to every story. Or in this case, every cause. The only thing that really bugged me was Jenna’s incessant need to have the boys in the book like her. I don’t mean that she wanted every guy to fall in love with her, no. But when she was trying to make friends, she basically let them treat her like dirt and then was still trying to find ways for them to like her. I mean, there’s no way they were the ONLY teens in the town. I totally would have told them to go jump in the lake, but that’s just me. And it may explain why I didn’t have a lot of friends as a teen. There are some twists and turns and a bit of romance, as there should be in any self-respecting YA book. None of it felt heavy handed, though and McDonald did a great job of weaving them into Jenna’s story. So, while I didn’t love Boys, Bears and a Serious Pair of Hiking Boots, I did like it an awful lot. Thanks bunches to the folks at Candlewick press for the review copy. Man, don’t you love when you pick up a book to read and about three sentence in you’re like, “This rocks!”. Yeah, that’s how it was for me and Word Nerd by Susin Nielsen. Ambrose, and all of the characters, are wonderfully quirky, but not so much that they aren’t believable. All of us, regardless of our age, know or have known an Ambrose (some of us have been an Ambrose). Awkward, geeky, no social skills yet blissfully unaware most of the time. He was just such a great character to read about and get to know, from his scrabble loving ways to his purple pants and hand made hat. The friendship that blossoms between Ambrose and Cosmo is so unlikely, yet makes perfect sense at the same time. Kinda like when someone dares you to eat some food combination that should be gross but is totally delicious. Nielsen has written episodes of the popular Canadian TV series Degrassi Junior High and also four Degrassi books (there are Degrassi books? MUST FIND! ), so she is well versed and well practiced in writing about youngsters. And it shows in her writing. Everything described, no matter how weird, is believable. There are messages in Word Nerd but they don’t seem forced. From family love, to getting over our fears after losing someone, to realizing that no matter how weird you are, there’s a place where you fit in, this is just a warm and funny and fuzzy book. And I can’t wait to read more from this author. Only two weeks ago, life was all too predictable. But that was before I saw my first ghost. Now along with my supernatural friends Tori, Derek, and Simon, I’m on the run from the Edison Group, which genetically altered us as part of their sinister experiment. We’re hiding in a safe house that might not be as safe as it seems. We’ll be gone soon anyway, back to rescue those we’d left behind and take out the Edison Group . . . or so we hope. Kelley Armstrong is one of my favorite authors, plain and simple. I’ve read everything she has published and never once have I been disappointed. That goes for the final installment of her YA trilogy, The Reckoning, as well. I loved it. This was another one day read for me, as all of Kelley’s books tend to be. Once I got into it, I simply didn’t want to put it down. The plot, the writing, the characters – it was all perfect. I love Chloe as a main character and I was sad that the trilogy had ended. But at the same time that’s the great thing about Kelley and her approach to her series: she writes what the series needs, not necessarily what her audience wants. She’s taken flack for this in the past, but I think it’s great. And also one of the reasons her writing and her series never get stale. Okay, the book. What can I say? There’s a lot of personal growth for the characters in The Reckoning and it was nice to see the four come together and work as a group. Chloe also learns more about her powers and how to use them. Dereck, who was my least favorite character in the first two books, emerged as my favorite character. We get a better understanding for him and some of the actions he takes. There’s a bit of romance, but just a smidgen, which is perfect for my tastes. The romantic stuff is very secondary to the plot, so it never felt like this was a romance disguised as a paranormal book. Kelley’s writing style is descriptive, yet quick and the action flows at a break neck speed. And the scenes where Chloe does some of her necromancer stuff? Goosebumpy fun! I also loved the nods to her Women of the Otherworld series. Every time a Cabal was mentioned, or the werewolf pack, I giggled just a bit. Thanks muchly to Random House Canada for the review copy. I recently won Becca Fitzpatrick’s Hush, Hush as part of a prize pack. The thing is, I already own it. All of my friends already own it. Then I realize I have a whole slew of friends who may not have read it – my readers and online peeps. So, I’m giving one of my copies away! And I promise it won’t be the one the cat chewed. To enter, comment below and tell me if you had wings, what would they be made of? Get creative, get silly. Have fun. *NEW* So, I’ve decided to add some surprises to Hush, Hush. And no, I won’t tell you what, no matter how much you beg! 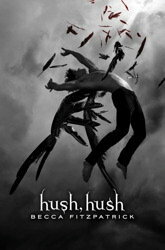 What I will tell you is that at least one other book will be accompanying Hush, Hush. And depending on my mood on draw day, I’ll throw in some other bookish things, too.